I don’t know how long I had been running when my mind hit a wall. I no longer understood why my feet still carried me forward. It was futile. Where was I going? There was no end—no goal—in sight. So what was I running towards? Not only that, but it dawned on me that I seemed to have lost track of the one who had gotten me started on this race: my teammate. My dearest friend. Had I forgotten something he said, something I was supposed to receive from him? I racked my brain as I scratched my head. I still ran, but without a sense of direction my feet and legs were soon overcome by weariness. My knees wobbled like rubber as my feet slapped the track one after the other. I didn’t know how much longer I could run before my legs gave way so I began to panic, again searching my mind for understanding as to how I had gotten here and what I possibly could have missed. Someone was calling me from behind, I thought. The voice sounded distant and I couldn’t make out the words, but they seemed to be directed at me. I was surprised by the tug I felt in my rapidly beating heart in response to the indiscernible call, as if the voice might have been telling me to slow down, to give the life-pumping muscle a break. My chest rose and fell with another onslaught of panic. How could I stop? What would happen? Even if in this moment I didn’t know where I was heading, at least I was running. The voice called again. This time I shut my eyes as if it would help me hear better. Then something strange happened. I didn’t hear the words with my ears, but rather their translation seemed to rush through that muscle in my chest, making it swell. Truth. What I felt was truth. And the truth told me to stop. And the truth brought tears to my jaded eyes. So I stopped, bent over and supported my weight with my hands on my lower thighs. 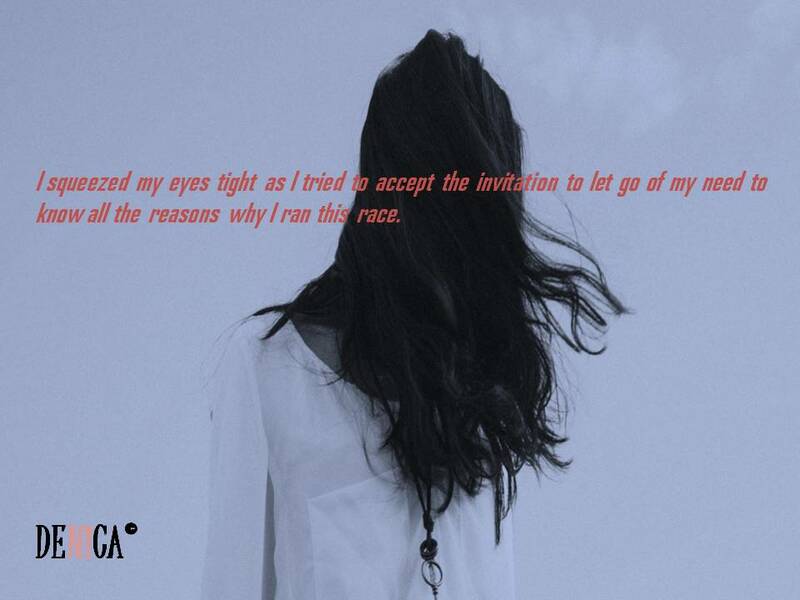 I squeezed my eyes tight as I tried to accept the invitation to let go of my need to know all the reasons why I ran this race. I tried to let go of my need to control where I was heading. And then something from behind began to draw me backwards. My body followed the pull before my mind caught up. Letting go felt like free falling into emptiness. Nevertheless, I soon found myself jogging in reverse even though I understood nothing and it seemed everything I’d grown to rely on to give me strength in this race was peeling away from me as I moved backwards on the track. I couldn’t make out the images that zoomed ahead as I backtracked through every previously forward-moving footfall. An invisible force seemed to be pulling me back to some unknown starting point. Though fear gripped me, my heart told my mind to have confidence. This undoing was uncomfortable but necessary, much like a life-saving surgery. It was painful to run backwards; I had to use different muscles than I was used to. I had to confess to myself that some of the muscles I had employed before were no longer fit and perhaps had been misused at times. At last my feet came to a stop when I heard someone whisper beside me. The rush of breath warmed my ear and caused me to turn my gaze. There I found the one I had missed—my partner, teammate and most faithful cheerleader. He was running, holding a long cylindrical object in his hand. I watched as he passed me, but then he slowed and turned his head to look back at me, holding out the metallic object behind him. So I ran. And as I caught up to him, I couldn’t believe the regeneration that rushed through my body and soul. I couldn’t remember the last time I’d had this kind of energy and purpose. I kept my eyes on my partner as we ran side by side. I sensed his support in his very gaze, and I was no longer so concerned with how well I executed this race or even where I was headed, as long as I had this man’s backing. He dipped his head at me and smiled. Soon, I would take the baton and run ahead. But this time it would be different, because I had finally opened my hands so that my partner could give me the only thing I’d needed from the very start—the truth that he, the passer, was more important than both the baton and the race itself. And that is what would keep me going.